They are back! Printable coupons from Quiznos that make for a bargain lunch or dinner. You do not need to give them your e-mail address to print these coupons either! Print Your Quiznos Coupons Today! I updated the current Halloween Candy printable coupons. I deleted the coupons no longer available but added this great new Mars coupon! This doesn’t even have any size restrictions so you can buy the little bags and save more per ounce. If you shop at Kroger you can use a Save $2.00 when you spend $5.00 on any candy e–coupon. Unfortunately, digital coupons and paper coupons may not be combined on the purchase of a single item. These coupons won’t last long. So print them now and get your Halloween candy at a bargain price! Why pay more than you need to for Halloween candy!? Wondering what a good price is on Halloween candy? Have you bought your candy yet? A new Haribo candy printable coupon came up today. This coupon works well at Kroger and other stores as well. The Gummi Bears are on sale this week at Kroger for just $1 a bag and then with the coupon doubled each bag costs just $0.40! This makes for bargain candy. These are priced at under $1 after Walmart as well. I often use these for toppings for a sundae bar! This coupon never lasts long so be sure to print it today. Click here to print your Haribo coupons today! Here is a great offer. Not only do you get printable Kellogg coupons when you sign up but you also get a chance to win a trip for two to cheer on Team USA at the 2012 Olympics in London. Sign up above to get your Kellogg printable coupons and who knows maybe you could get lucky and win the trip. Here are some great new toy coupons! How can you resist $5.00 off any Little People toy or $5.00 off any Imaginext toy purchase of $24.99 . Know anyone having a baby? This is a great way to save on a baby shower gift! Print your coupons today. My guess is these will not last long. Considering a Blu-ray DVD for Valentine’s day? Then check out all these great new printable Blu-ray DVD coupons! 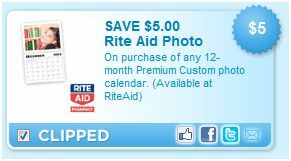 There are some great new printable coupons for the Rite Aid Photo Center. These will work great for photo gifts that you need quickly. Print your coupons for the Rite Aid Photo Center today! Looking for online photo deals be sure to look here. If you were lucky enough to get a new $5 Target gift card when you buy 5 SC Johnson items coupon in your paper yesterday, you can actually make money when you but Glade products at Target. If you don’t have this coupon, (It was not in my Detroit paper.) you can still get candles at bargain prices because Glade products are on sale for $2.50 at Target, and you’ll get back a $5 gift card when you buy 5. Here’s how to Make Money on Glade candles. If you do not have the regional coupon your final cost is $3.95 or just $.79 each! This scenario should work just fine. I have heard from others that not a single coupon beeped! Let me know if you come up with any other scenarios to use that SC Johnson gift card coupon on. Click on Home Entertainment to find them quickly. If there are any DVDs on your holiday list, be sure to print some of these DVD printable coupons. Print Your Free DVD Printable Coupons Today! 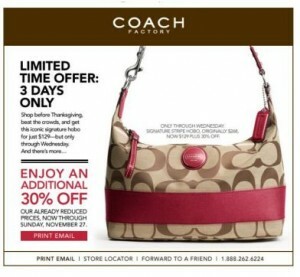 There is a new Black Friday printable coupon for the Coach Factory outlet and it is for 30% off! This coupon will be valid on Black Friday. I love Coach purses but getting them for a bargain price is not easy. This coupon is good through November 27, 2011. I think of this as a double deal. The purses are already quite marked down at the outlet plus you get an extra 30% off with the coupon.